I remember a time when sounding like, or even appearing the slightest bit like anyone else was cause for a beat down in Hip Hop. To quote Steven A. Smith “Quite Frankly!" I want those days back. It’s bad enough nowadays that everyone wants to go into the booth and instead of taking time to concentrate on what they’re about to say, they want to freestyle on records. No, that was not a diss towards the Jay-Z/Biggie style of Writing lyrics in their heads. Unlike those chumps who imitate they actually took their time and wrote the words in their minds. Yet this is a topic for another day. Lets address the plague that’s running wild like a headless chicken in Hip-Hop. The steroids of rap, ghostwriting. Lately we’ve seen the impact on sports in general with the whole steroids epidemic. Mostly standing out in baseball with Barry Bond’s chasing and then surpassing Babe Ruth's home run record. Now the allegations against Lance Armstrong as well as fellow cyclist Floyd Landis (who tested positive for substance abuse). It’s been known for years that Puff or Diddy, whatever the hell he calls himself today is a notorious user of Ghostwriters. As Dj Drama said in a blog “Everyone ghostwrites for Puff”. But is it really fair? Well not even fair, the question should be is it right? The art of rapping isn’t like pop or R&B songs, where someone else writes the song for some singer because singers expressed themselves through actual singing. Rapping is about you expressing yourself through your own words not someone else’s. Maybe the Hip Hop Gods need to come down with the Ten Commandments. Rule number one could be something like “If Thou Hast Not Written It, Thou Shalt Not Spit It” (hmm I think I‘m going to put that on a shirt). This has gotten ridiculous to think that someone would strut around claiming they’re ill but doesn’t even write their own rhymes. Bad enough people pretend to be something they're not in order to be famous, but this is another level of disgrace. 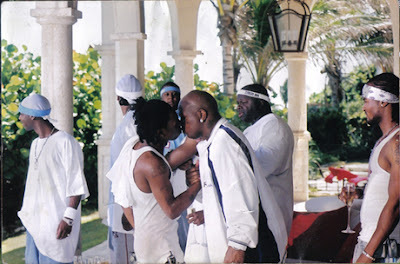 The “Steroids Of Rap” scandal has a new face: Lil Wayne vs. Gillie. Gillie the ex-Cash Money artist from Philly has been out and about trash talking Lil Wayne’s seemingly overnight lyrical growth. Stating that in fact he ghostwrote for Weezy F. Baby’s (please say the baby) ‘The Carter’. Which by the way is held as a critically acclaim album, some even consider a classic. I mean Gillie has been going full-force with this appearing on radio, magazines, and even an embarrassing moment that felt straight out of the Black Exploitation movies on MTV Sucker Free. Where he, accompanied by the Clipse let it be known to all the teenyboppers that Wayne was a fraud. Lets just say that it was silent enough to hear a fly land on a moving locomotive in the MTV studio. The idea that the man that is most considered the prominent lyrical rapper from the south may have been so only because an east coast artist gave him his swag is a major blow to the south in general. Especially since The Carter II while a decent album fell short of what the first installment brought us and Gillie has gone out his way to claim he wasn’t there to right for that one. Could it of been a possible case of Barry Bonds being jealous of the love Mark McGuire and Sammy were getting that he decided to get a performance boost. In Wayne’s case being the only souljah left on Cash Money, while Juvenile and B.G. where getting love, could it be that in-order to stand out he possibly enlisted the help of Gillie to give his lyrical skills a boost? Or maybe a case of someone exploiting him to get some shine of their own. Worst yet is the fact that a rapper like Young Joc had his number one song “Going Down” ghost written by his producer Netty. Netty exposed this and bashed Joc for his lack of skill in an issue of XXL Magazine. This has got to be where the buck stops. You mean to tell me you’re so untalented in writing rhymes that the producer has to write one of the wackest joints ever heard. “Verse number two, do the damn thing” Are you kidding me!? Who the hell starts a verse by saying verse number two, how can these guys get deals? Next you’ll hear D4L come out saying they didn’t write that “Laffy Taffy” mess. Rumors have circulated for years that some of your favorite artists used ghostwriters. Puff of course, but even one so bold to say Nas wrote for Rakim. Yea crazy isn’t it. Almost down right blasphemous to even imagine. What are we to feel when you find out an artist uses a ghostwriter? I said it before that this isn’t R&B where you sing what someone wrote for you. This is Hip Hop, this is rap baby where you EXPRESS YOUR SELF! I can’t lie, I lose a lot of respect for those who use ghost writers (example: Eazy-E, Dr. Dre) but lose even more respect for those who write for them (Ice Cube, D.O.C. and Jay-Z). I remember watching QDIII’s DVD on ‘The MC’, it’s a documentary brought to you by the man who made the infamous Beef series. Back on subject, Krs-One had said something that always stayed in my heart about the whole idea of ghostwriters. I’m going to pretty much paraphrase but it went along the lines of “when you sell something you write, you sell a piece of your soul. So in fact you're selling yourself because the words on the paper came from no where else but from in you.” Think about that, let it marinade for a minute. I understand that we all can’t get inside the industry and get the shine some of the other maybe lesser deserving cats have. I understand and feel people when you say its good 'easy money'. Please don’t get me wrong and think I’ve never worn those shoes and considered going the ghostwriting route. I have, but I just can’t do it bro. I just can’t really respect anyone who will basically sell themselves to someone else just for some quick bucks. There is this thing I have that I like to hold on to called Integrity. It would actually sicken me to see or hear someone else quote my rhymes, fronting all over the T.V. like they were the genius that wrote it (not saying that I’m some genius, just using it for dramatic effect). What if someone came out like Jaz-O exposing that he actually ghostwrote for Jay-Z or some dude wrote for Nas? Same thing for Pac, Biggie, Pun. What if someone out of the blue could prove they actually ghostwrote for them? All this time we’d have been giving props and arguing over lies. The fact of the matter is the fool that is in the limelight getting rich and famous by faking is a liar. Just like lip-synching is a huge no-no in the world or R&B and Pop, ghostwriting is a huge no-no to us that love Hip Hop. What it may really come down to is the fact that creativity and originality in Hip Hop has come to a stand still. In large part thanks to the big wigs at these record labels who want to just clone artist success. Forcing the idea of being original out of the door and following a Mini Vanilli formula in. So now it is easier to not really give a flying (you fill in the blank) about selling a original piece of yourself for some money because it’s all about making money nowadays. People will do anything to get it. “Don’t worry if I write rhymes, I write checks” I guess that pretty much can sum up the mentality of the industry today. You know what the saddest part about that rhyme is? The fact that he didn’t even write it.